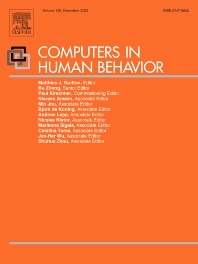 Computers in Human Behavior is a scholarly journal dedicated to examining the use of computers from a psychological perspective. Original theoretical works, research reports, literature reviews, software reviews, book reviews and announcements are published. The journal addresses both the use of computers in psychology, psychiatry and related disciplines as well as the psychological impact of computer use on individuals, groups and society. The former category includes articles exploring the use of computers for professional practice, training, research and theory development. The latter category includes articles dealing with the psychological effects of computers on phenomena such as human development, learning, cognition, personality, and social interactions. The journal addresses human interactions with computers, not computers per se. The computer is discussed only as a medium through which human behaviors are shaped and expressed. The primary message of most articles involves information about human behavior. Therefore, professionals with an interest in the psychological aspects of computer use, but with limited knowledge of computers, will find this journal of interest.